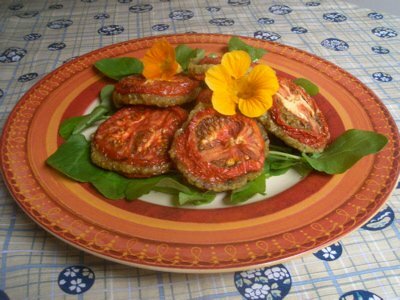 The yummy filling consists of soaked pignoli nut pate, sandwiched between 2 vine tomatoes. I then dehydrated these for about 6 hours, flipped, and dehydrated again till they held together nicely. They were gone shortly after I took the picture! Good thing for veggie friends with big appetites! This entry was posted in Raw Foods and tagged raw foods, Rawviolis, tomatoes, vegan, vegpod.